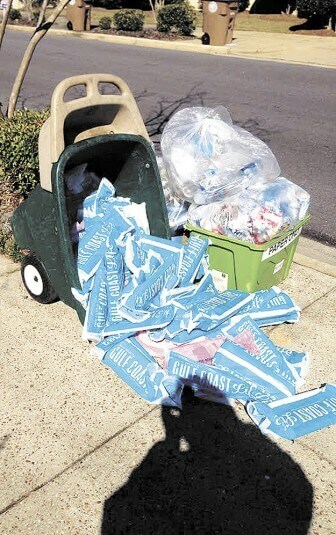 Mobile Baykeeper has decided to enter the fray in helping city residents who want to stop the Press-Register from continuing to throw unsolicited bags of advertising circulars in their yards. The effort was sparked by a Press-Register representative at the March 3 City Council meeting claiming the company was getting far more requests to have the circulars delivered than there were to have them stopped. Baykeeper Executive Director Casi Callaway took to Facebook asking citizens to post pictures of the bags of Gulf Coast Life circulars, as well as letting them know how often they’ve tried to cancel. Over 180 ad circulars collected off neighborhood curbs during a two-week period by a resident. Baykeeper says from the initiation of their efforts last week, five posts were made and drew about 12,600 likes and had 122 shares straight from their Facebook page. Baykeeper staff estimate their campaign influenced 328 cancellations of Gulf Coast Life, although that number comes only from those who publicly announced they had cancelled. Baykeeper’s efforts to help citizens who wish to have the Press-Register stop throwing the circulars in their yards comes as the City Council is still debating a resolution about such advertising. 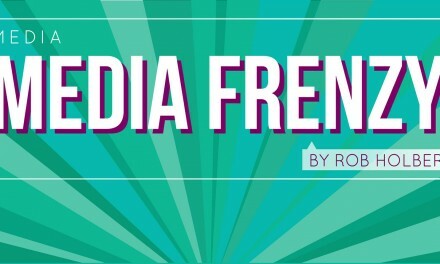 Whether an ordinance is actually passed and whether it will exempt the Press-Register from being cited for continuing to throw the circulars is still being worked out between the city’s attorneys and attorneys for Alabama Media Group. But Callaway agrees with Mayor Sandy Stimpson, whose administration has pointed to the circulars as a major source of litter in the city and pollution in area waterways. For their part, the Press-Register and AMG have argued throwing the circulars unsolicited into area yards is protected by the First Amendment and have threatened to sue if the city attempts to stop the practice. Circulation information obtained from the Press-Register shows the company is putting out 210,000 pieces of Gulf Coast Life each week across Mobile and Baldwin Counties. By zip code within the city of Mobile, it can be seen that more affluent areas generally receive more of the circulars. For instance, the 36695 zip in West Mobile gets 16,361 pieces thrown. Spring Hill’s 36608 zip isn’t far behind, with more than 11,000 pieces thrown. By comparison, 36607 has just 2,463 thrown, 36602 has 648 and 36603 has 2,312. The latest circulation figures for the Press-Register show the newspaper continues trending sharply downward. Even though the latest figures now include distribution from Mississippi — which at one time was a separate newspaper — the numbers show decline. Wednesday’s total circulation is now just over about 49,000. Friday’s paper sells just about 48,700 and Sunday is now down to 75,056. By comparison, in November 2013 Wednesday circulation was listed at 54,400 and Friday was 56,666. That’s roughly a 10 percent decrease for Wednesday and a 14 percent decrease for Friday. Sunday’s decrease from 78,600 in November 2013 is about 4 percent. A week after a Lagniappe reporter and a Press-Register reporter were both tossed from a Bayou la Batre work session after questioning why they were being forced to move from two seats near the City Council podium, a television reporter was allowed to stand in the same spot and record. Lagniappe reporter Jason Johnson and P-R reporter Michael Finch were both escorted out of the meeting by a Bayou la Batre police officer after Mayor Brett Dungan ordered them removed prior to the meeting’s start. City Clerk Jamie Abastoflor had asked them to move from two chairs they were occupying near the council podium. When Finch asked why, Abastoflor said they were too close and would be able to hear what councilors whispered to one another. Abastoflor contended that only things said through the microphone were public. Despite the apparent concern over council members being overheard whispering, the next week WPMI reporter Jasmine Williams was allowed to stand in the same spot and record the meeting. An ongoing fight between AT&T and the Muir Woods Homeowners Association appears to have come to a resolution that will take another 18 months to be realized. On March 6, the two groups agreed to work together to co-locate AT&T’s antennas and additional equipment to an existing nearby tower located behind the Publix Supermarket off Hillcrest Road. The Homeowners Association petitioned the Mobile City Council to allow a continuance on the matter until September 2016 in order to allow both parties to finalize the new site. Mobile’s amateur radio operators will be dialing up some fun April 11 when they host their annual Ham Fest at the Abba Shrine Center. There will be radio equipment vendors from around the region, along with local enthusiasts, will be selling new and used equipment. Also, local Boy Scouts will be there with an amateur radio station demonstration. The event takes place at 7701 Hitt Road, and admission is $5, and children 12 and under are admitted free. Military, civil servants and scouts in uniform will be admitted free. License testing will begin at 9 a.m. for those wishing to become a ham radio operator.